Spring has sprung and it's a great time to knit a lighter weight cowl so let's do it together! The new 1-Skein Zigzag Cowl is the perfect neck warmer size cowl to throw on to keep you just warm enough. Sometimes those spring days still have a little nip in the air and this lacy cowl will be a pretty addition to your wardrobe for days like that! So pretty! Grab your needles and Ewe So Sporty yarn. Go! Or if you haven't gotten your supplies yet, you can get the 1-Skein Zigzag Cowl on Ravelry. Use code: zigzag for a discount! Plus, choose your color of Ewe So Sporty merino yarn and find a Ewe Ewe yarn store near you with our handy map. Cast on in the way you normally would. I use the long-tail cast on as my go-to. 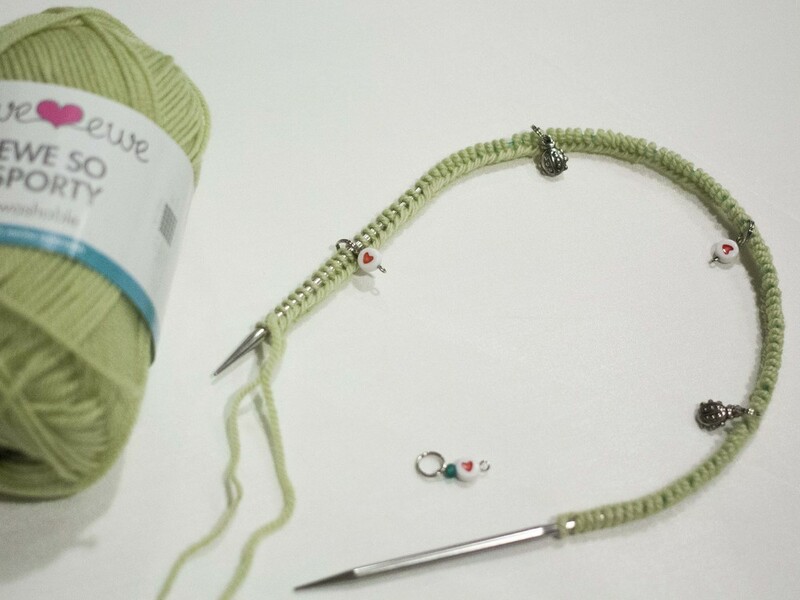 One little tip here is to add stitch markers as you are casting on. Try placing one every 25 stitches and this helps you easily keep track of your stitch count. I find it easier because there's always something to distract me... someone asks me a question, I get sucked in to a good TV show, I get a text message and suddenly it's a half hour later and I've made plans for Friday night?? Anyway, add some extra stitch markers, they make life so much easier! I keep one more spare marker to use for joining the cowl in the round. Notice how it's a little different than the others? I'll add this marker in the next step and then remove the other four markers as I knit around the first row of the pattern. Knitting in the round is as simple as connecting the two ends of the cast on. 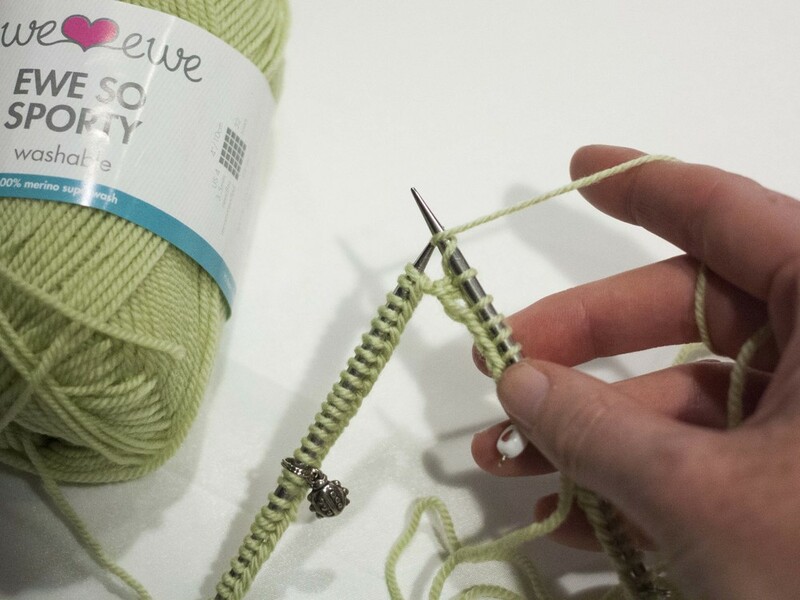 Stretch your cast on stitches around your circular needle and make sure they're not twisted over the needle. Take the working yarn coming from the skein and knit in to the first stitch at the other end of the needle. For me, using a long-tail cast on I am knitting in to the first loop where I made the slipknot. Bam! Your knitting is connected and you're knitting in the round! Our first instruction tells us to knit 6 stitches then k2tog. 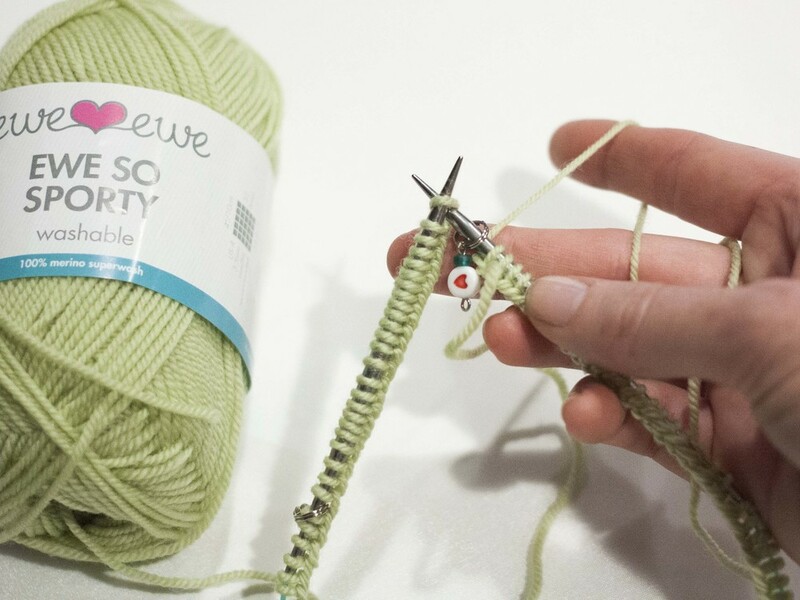 Knitting two stitches together is as easy as it sounds. Just put your needle through two stitches instead of one. They'll combine and decrease your stitches from two to one. After the k2tog decrease we need to increase one stitch and make those pretty lace holes in the cowl. That's done with a yarn over or YO. 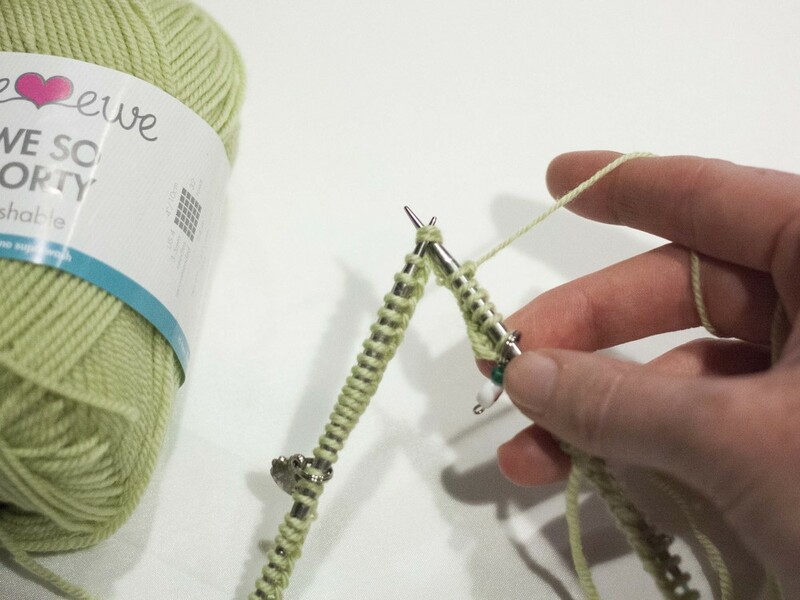 To YO you just wrap your yarn around the righthand needle, no stitch needed! Here's the trickiest (but still easy) part of this pattern. After the YO we need to start purling and that means we need to get the working yarn to the front of the work. To do this you'll bring your yarn around the needle once again. It almost looks like there's a double loop on the needle but, don't worry, there's not. Now start purling and it all works out! And there you have it! Knits, k2tog, YO and purls. Now just keep doing that around and around. Let's try and work through Row 14 and I'll be back on Thursday to show you some more fun stuff! Follow along by checking eweewe.com, Instagram, Ravelry, Facebook and Twitter. Pretty much anywhere! Be sure to post photos of your cowl as you knit or when your finished. Use hashtag #ZigzagKAL.